Many of you have enjoyed the “Moving Forward, Looking Back” series of articles by Andrew Parr, our “unofficial historian.” This month, Parr outdoes himself with “Records Revisited,” the seventh installment in his nine-part series. In it, he provides a fascinating look into the over-the-top world of record-breakers, many of whom have been featured in past issues of GAMES. There are marathon video gamers, high-reaching card stackers, and competitive eaters, whose stomach-turning exploits are not for the faint of heart. Turn to page 34 to read all about it—preferably not during mealtime. If you’re a word game enthusiast looking for a new challenge, check out “Your Word Against Mine” on page 38. Scott Appel, our regular columnist, steps aside as guest writer Joe Edley, three-time North American Scrabble Champion and author of Everything Scrabble, reviews an app called Libretto. This game is somewhat similar to Scrabble but its appeal lies in its emphasis on strategy. Edley has high praise for the app and its features. To get a feel for it, you can try the puzzles offered alongside the review. Who knows, you might get hooked! As always, puzzlers have lots to choose from in our Pencilwise section. 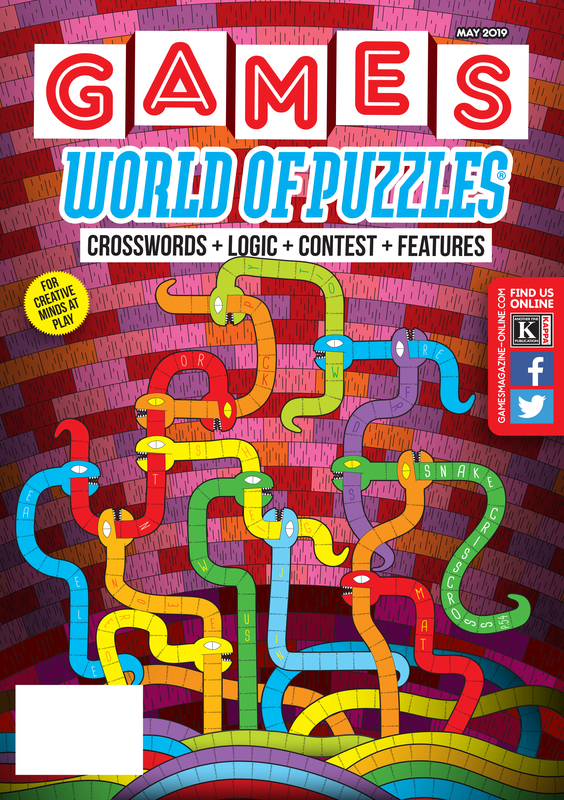 Grant Fikes’ “Snake Crisscross” (page 54), the puzzle featured on this issue’s cover, is a crossword variant/crisscross hybrid. Give it a shot! And don’t miss “Test Your Trivia I.Q.” (page 64) by former GAMES editor in chief R. Wayne Schmittberger. This quiz covers a wide range of subjects and will challenge even the most confident trivia whiz. On the logic and math side, there’s plenty to choose from: “Skyscrapers” by Conceptis Ltd. (page 13), the logic puzzle “Jazz Legends” by Margery Albis (page 30), and the solitaire game “BoxOff” by Steven Meyers (page 50). So what are you waiting for? Grab a pencil and get puzzling!